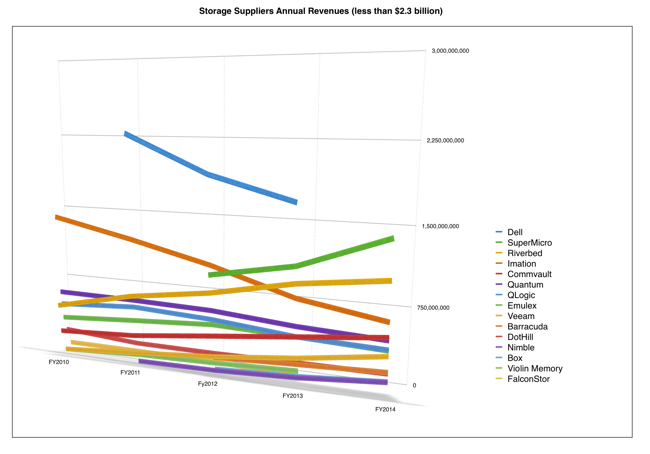 A look at four years' worth of storage supplier revenues shows us which suppliers are winning, losing or standing still. 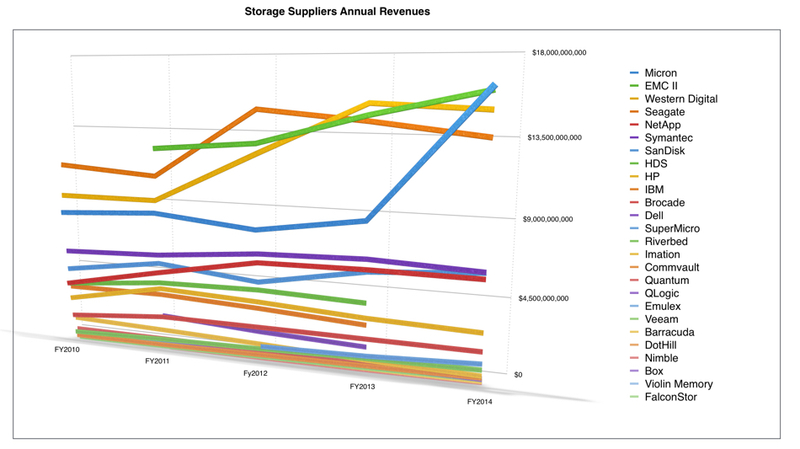 The chart shows annual revenues for storage suppliers, or the storage business of larger suppliers, insofar as it can be identified, from 2010 to 2014. It's crude as suppliers' calendar and fiscal years don't always coincide - so view it as a rough and ready approximation. 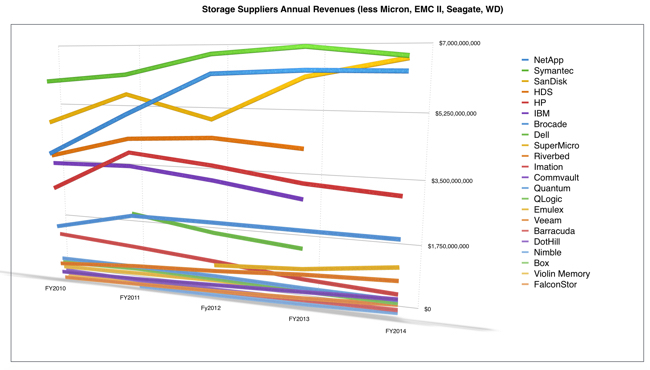 That being said Micron is the obvious winner, outpacing EMC II (Information Infrastructure; basically EMC minus Pivotal and VMware), Western Digital and Seagate. Basically, your basic storage components - disks and flash dies and SSDs - outsell storage systems for everyone except EMC II. No other storage supplier has a presence in the $6 billion - $18 billion ball game. EMC II's rise above Seagate and WD is impressive but it's been pipped at the post by Micron, betting big on flash and buying Elpida. NetApp fails to lead the remaining suppliers because its revenue growth has stalled, while that of SanDisk has not and Symantec's faltering has not affected its recent growth as much as NetApp has been set back in growth rate terms. Then we have HDS, and declining HP and IBM. Brocade is flatlining and Dell, now in private ownership, had fallen below Brocade before disappearing underneath the private equity invisibility cloak. Redrawing the chart for suppliers with revenues under $2.3 billion spreads out the bunch and makes clearer what's been going on there. Dell's revenue fall looks more dramatic while SuperMicro has risen strongly. Riverbed, notwithstanding activist-investor complaints, has grown well while Imation is a slo-mo train wreck. CommVault has done quite well and Veaam is growing steadily on a CommVault catch-up course. Hybrid array vendor Nimble Storage is growing, while Box is beginning to take off. Violin Memory and FalconStor have yet to show that they can return to their glory days.